People and vehicle access control specialist Nortech is now offering long-range vehicle and driver identification tags to grant seamless access to approaching vehicles. Designed to accompany the popular TRANSIT reader range from Nedap, the tags are ideal for use in staff car parks, for priority vehicle control, industrial site access control, fleet and parking management. Key features include simultaneous driver and vehicle identification, a reading distance of up to 10m, easy windshield mounting with suction pads and maximum perimeter security. The TRANSIT Prox Booster (120-125 KHz),SMARTCARD Booster (13.56MHz) and SMARTCARD Booster Ultimate (2.45GHz and 433MHz) enable long range driver based identification. Driver based ID systems, a building access card and in-vehicle booster ensure that a vehicle can never gain access to a secured area unless occupied by an authorised driver. The booster is used in combination with a personal access credential and is an easy to integrate solution for vehicle access, eliminating the need to issue new cards. The booster is placed on the windshield on the inside of a vehicle. When an authorised building access card is inserted into the booster, it is read and then boosted to the external Nedap TRANSIT reader. The TRANSIT reader then transmits the credential ID to any standard back end security panel. If the credential is authorised and access is granted the gate will open automatically. Removal of the driver ID then allows the access card to be used for building access. Users also have the facility to match up vehicles and drivers, as a separate ID (vehicle ID) can be programmed into the booster on certain models. This ensures the right driver is with the right vehicle. 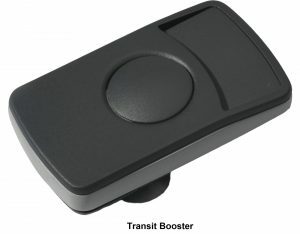 The TRANSIT Prox Booster 2G supports proximity access control cards operating on 120-125 kHz such as HID prox, EM and Nedap. The SMARTCARD Booster 2G supports ISO 14443 or 15693 compliant smartcards (eg. MIFARE, MIFARE DESFIRE, LEGIC, Calypso and HID iClass) operating on 13.56 MHz. The SMARTCARD Booster Ultimate is also available for almost all card technologies. It supports ISO 14443 or 15693 compliant smartcards (eg. MIFARE, MIFARE DESFIRE, LEGIC, Calypso and HID iClass) operating on 13.56 MHz. The advanced tag authentication of the SMARTCARD Booster Ultimate is only functional when the Security Key Pack has been installed in the TRANSIT Ultimate. Typical booster applicationsare high secured areas like airports, seaports, military bases, utility companies, corporate and educational campuses, police, fire and other installations where vehicles must be assigned to a specific driver. CAPTION FOR IMAGE:People and vehicle access control specialist Nortech is now offering long-range vehicle and driver identification tags to grant seamless access to approaching vehicles. Designed to accompany the popular TRANSIT reader range from Nedap, the tags are ideal for use in staff car parks, for priority vehicle control, industrial site access control, fleet and parking management.